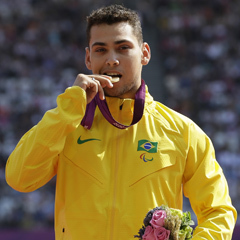 London - Gold medallist in the men’s T43-44 200m final, Brazilian Alan Oliveira said he was upset to hear Oscar Pistorius’s comments about his prosthetic blades, but he did not want to get involved in an argument. Pistorius responded with an emotional outburst after finishing second in the Paralympic event he was widely tipped to win on Sunday. Having set a new T43 world record in 21.30 seconds in the heats the previous evening, it looked a certainty that South Africa's "Blade Runner" would romp home to defend the title he won at the two previous Games in Athens and Beijing. Oliveira made up about eight metres in the finishing straight to overtake Pistorius at the finish line. “It’s not just about the prostheses, there is training behind my performance,” Oliveira said. Immediately after the race, Pistorius raised concerns over the length of the prosthetic blades used by both Oliveira and American athlete Blake Leeper, who took the bronze. “He is not a bad loser - Pistorius is a great athlete,” Oliveira said. “I’m just sad with the interview where he said that my blades are too big. “He was bothered by my time in the heats and wanted to get to me with this polemic with the blades, but it did not work. Oliveira said he was disappointed because he had always admired the South African, who competed in the recently concluded able-bodied Olympics, but he said he got his strength from all the support he had received back home in Brazil. “For me, he is really a great idol and to listen to that coming from a great idol, it’s difficult. Pistorius apologised in the early hours of Monday morning for the timing of his comments and said he did not want to detract from another athlete’s moment of triumph. "That was Alan's moment and I would like to put on record the respect I have for him," Pistorius said. "I am a proud Paralympian and believe in the fairness of sport. "I am happy to work with the IPC (International Paralympic Committee) who obviously share these aims... I do believe that there is an issue here and I welcome the opportunity to discuss it with the IPC, but I accept that raising these concerns immediately as I stepped off the track was wrong."